Every year, the Library Research Service’s Public Library Annual Report surveys Colorado public libraries about challenges to their materials or services. The libraries that report receiving one or more challenges are then asked to provide additional information. 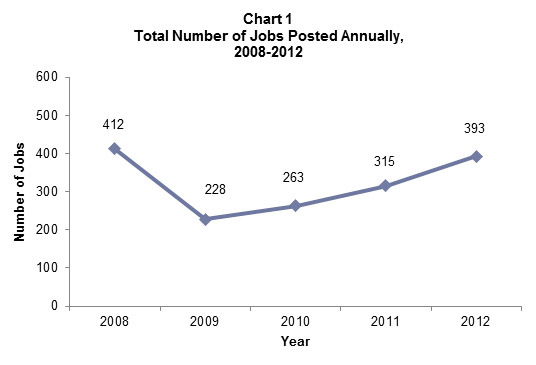 This Fast Facts addresses the number, nature, and outcome of the challenges that occurred in 2012. 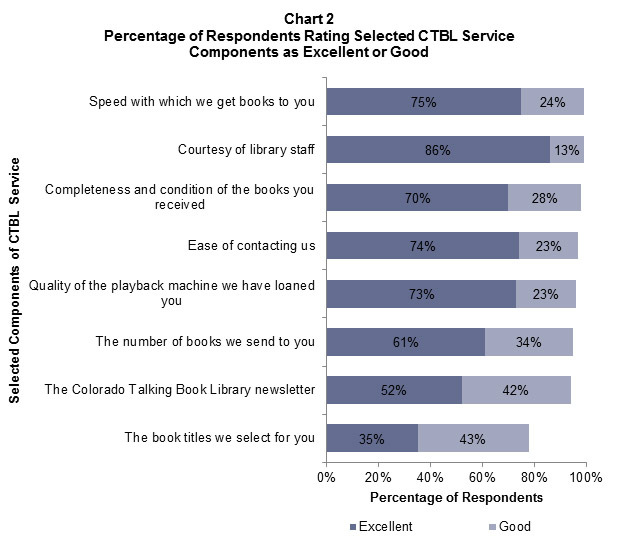 In 2012, the Library Research Service (LRS) adminstered a patron satisfaction and outcome survey for the Colorado Talking Book Library (CTBL). This was the fifth time that this survey has been administered since 2004. The survey was designed to assist CTBL in its ongoing efforts to evaluate its services, and the results indicate that an overwhelming majority of patrons are very pleased with the services CTBL provides. 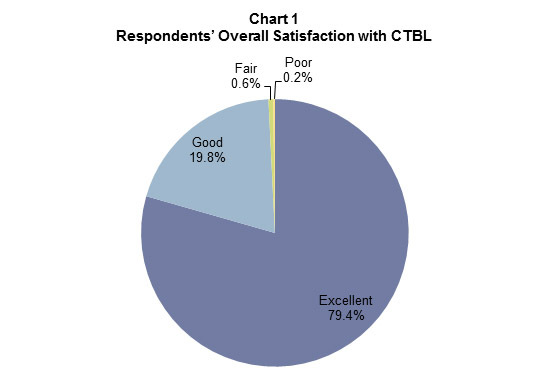 Nearly all respondents (99%) rated their overall satisfaction with CTBL as excellent or good, which is consistent with prior years (see Chart 1). The Colorado Talking Book Library (CTBL) provides free library services to more than 6,000 patrons who, because of physical, visual, or learning disabilities, are unable to read standard print material.CTBL’s collection consists of 58,000 talking books, 7,000 digital titles, 6,000 titles in Braille, 19,000 titles in large print, and about 300 descriptive videos.CTBL is part of the Colorado State Library, a division of the Colorado Department of Education, and is affiliated with the Library of Congress, National Library Service for the Blind and Physically Handicapped (NLS). 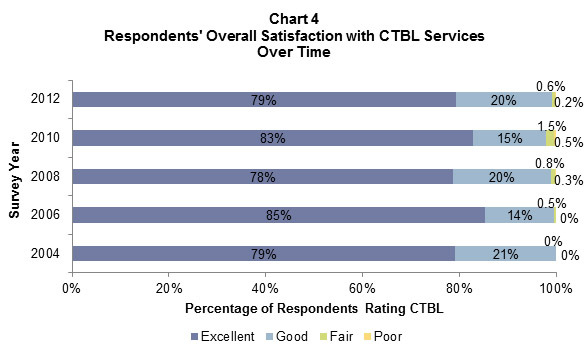 In addition to rating their overall satisfaction with CTBL, respondents were asked to rate their satisfaction with selected components of CTBL’s services. Three of these components were rated as excellent or good by at least 98 percent of the respondents: “courtesy of library staff,” “completeness and condition of books received,” and “speed with which they receive books” (see Chart 2). Although still at very high levels, the 2 lowest rated components of service were “the Colorado Talking Book Library newsletter” (81% excellent or good ratings) and “the book titles we select for you” (65% excellent or good ratings). Books may be ordered via mail, email, phone, fax, or online. The library loans playback machines free of charge to patrons. Patrons can request specific titles or books can be selected for them based on their reading interests. 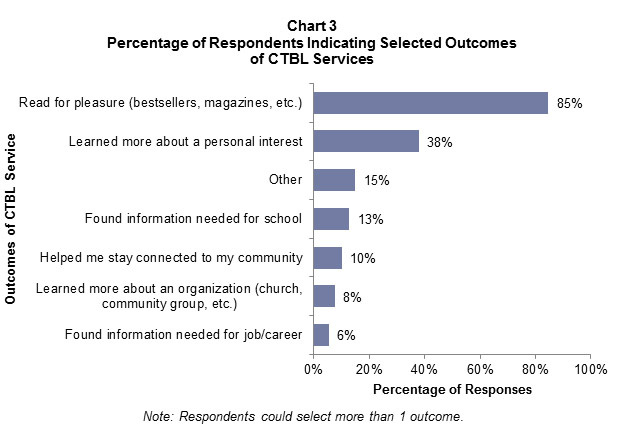 Over the years, reading for pleasure continues to be the most frequently valued outcome of CTBL service, selected by more than 4 out of 5 (85%) respondents in 2012 (see Chart 3). Several survey respondents’ comments reflected this as they frequently mentioned how CTBL’s services allowed them to continue enjoying reading despite challenges reading standard print books. The second most popular outcome, chosen by a bit more than one-third of respondents (38%), was “learned more about a personal interest using CTBL services.” Respondents were able to include additional information via an “Other” option, which 15 percent of respondents selected. Remarks included appreciation for materials delivery, book club availability, and services to dyslexic and low vision children and students. The majority of CTBL patrons responding to the survey indicated that they are very satisfied with the services provided. Nearly all respondents gave high ratings for their overall satisfaction with CTBL and individual service components. In addition to the high ratings, comments left by survey respondents provide insight into the important services CTBL provides to its patrons. Thanks to CTBL, its patrons are able to read for pleasure, learn about personal interests, and stay connected to their communities. This Fast Facts reports highlights from the study, which found that most websites broadly referenced early literacy information and contained storytime information. However, a lower percentage had a specific definition of the term “early literacy,” referenced early literacy skills, or had information on the importance of reading aloud. 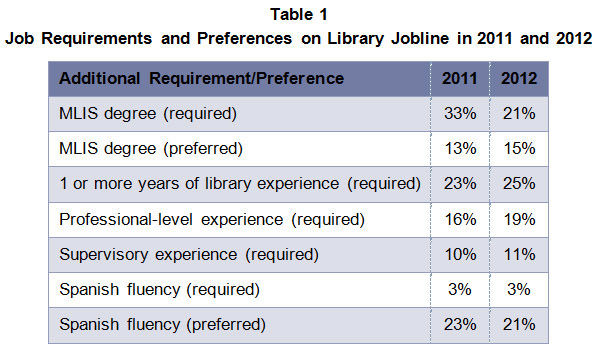 More than 4 in 5 libraries (86%) had a broad reference to early literacy (e.g., description of, links to resources, etc.) 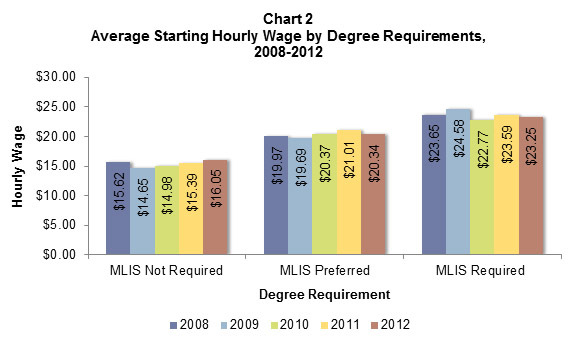 somewhere on their website (see Chart 1). Eighty-five percent featured programs including storytimes, summer reading, and/or other early literacy initiatives. 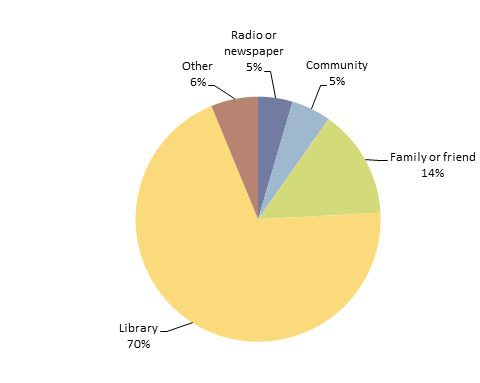 More than half of libraries (53%) had links to media (books, CDs, DVDs, etc.) or media lists for children ages 0 to 5, such as the Notable Children’s Books List by the American Library Association (ALA) or lists developed by the library itself. Almost 2 in 5 libraries (39%) linked to websites such as Great Websites for Kids by the Association for Library Service to Children (ALSC) and children’s e-book sites (e.g., Tumblebooks, StoryHour, etc.). Only about 1 in 7 referenced early literacy research on their website (15%), and/or provided early literacy brochures, tips, or guides (14%). 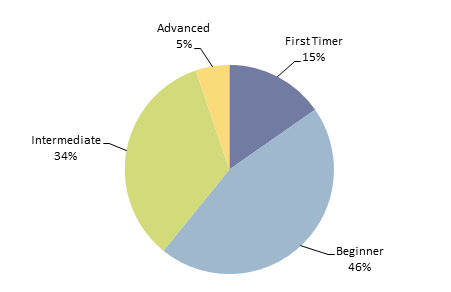 Less than 5 percent had information on early literacy training or workshops. Discussion of long-term benefits: A small percentage of library websites contained specific information on the long-term positive effects of building early literacy skills. Just about 1 in 10 libraries (12%) linked early literacy skills to improved school readiness. Other benefits of building early literacy skills, such as contributing to healthy early brain development and later success in life, were mentioned even less frequently. Definition of “early literacy” and description of early literacy skills: Only 7 percent of libraries had a brief definition of the term “early literacy,” while 15 percent had a description of early literacy skills on their websites. Information on the importance of reading aloud: Fifteen percent of libraries had information on the importance of reading aloud to children as a way to build early literacy skills. Just 8 percent highlighted the importance of reading aloud to babies beginning from birth and/or reading aloud every day. Of the 104 libraries that offered storytimes in 2011,8 98 had websites. 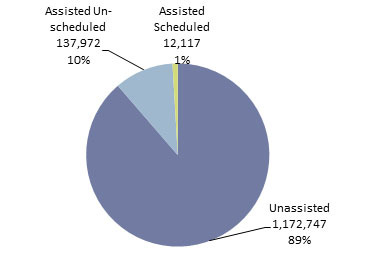 Of these 98, 85 percent posted their storytime schedule or calendar on their websites (see Chart 2). Nearly half of these libraries (46%) offered all-inclusive family storytimes for all age groups, and a similar percentage (44%) offered separate storytimes for different age groups, e.g. baby, toddler, and preschool. Some libraries offered both. Almost 1 in 3 libraries (29%) offered storytimes for babies beginning from birth. About 1 in 6 libraries offered storytimes with a certified animal (17%) and/or in Spanish or bilingual English and Spanish (16%), and 15 percent offered themed storytimes (e.g., pajama). Just 1 in 20 libraries (5%) offered storytimes in languages other than Spanish, including American Sign Language, Russian, and French. Less than 5 percent linked to a video example of storytime (4%),9 or contained “other” storytime information (e.g., outreach storytimes, etc.) (3%). 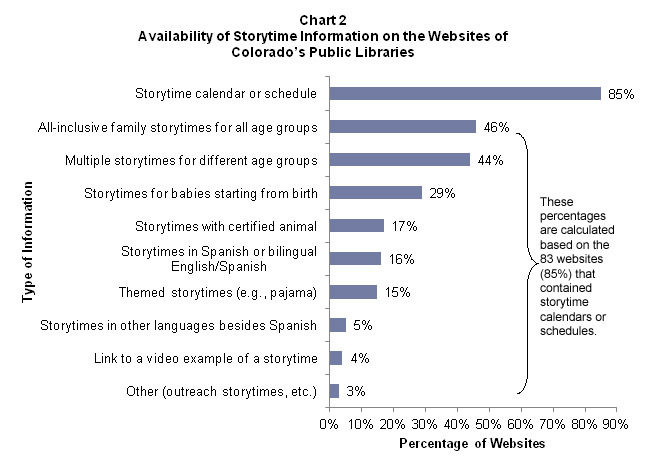 Almost 1 in 3 Colorado public libraries (29%) offer storytimes specifically for babies beginning from birth, based on schedule information available on their websites. One in 6 libraries (17%) provided early literacy information on their websites in Spanish. In contrast, just 1 in 16 libraries (6%) provided early literacy information in other languages besides Spanish on their websites. Examples of information resources included links to ¡Colorín Colorado! and the International Children’s Digital Library, early literacy handouts in Spanish, and a button on the homepage to translate the website into another language. 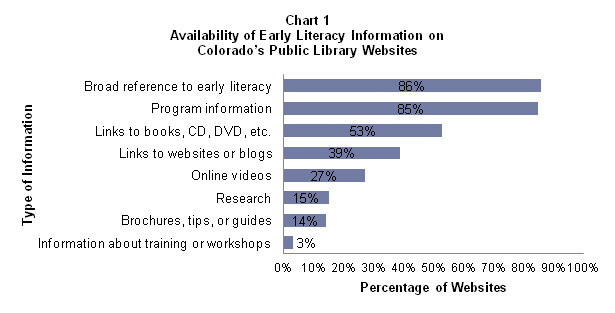 In 2008, Colorado Libraries for Early Literacy (CLEL) launched www.clel.org to bring together information about library early literacy programs and services in Colorado and to provide tools and resources for library staff. In 2009, CLEL developed StoryBlocks in partnership with Rocky Mountain PBS. StoryBlocks is a collection of 30- to 60-second videos designed to model songs, rhymes, and fingerplays in both English and Spanish to parents, caregivers, and library staff. Each video clip includes helpful early literacy tips to increase caregivers’ understanding of child development and pre-literacy needs. 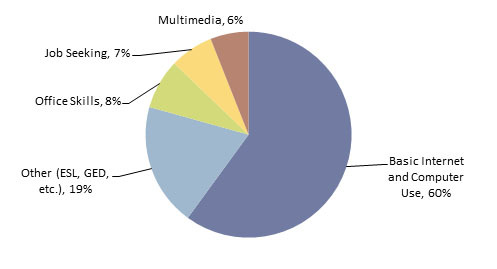 Close to 1 in 5 libraries (18%) provided a link to StoryBlocks videos on their websites. Results of this study indicate that Colorado’s public libraries have the possibility of promoting substantially more early literacy information on their websites. There is a real opportunity for Colorado’s public libraries to more fully use their websites to demonstrate the library’s critical role in educating parents, caregivers, and early childhood educators on the benefits of developing children’s early literacy skills. 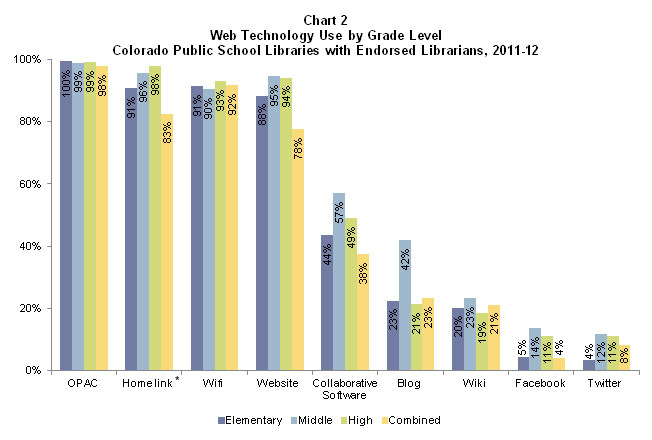 For the 2011-2012 school year, the annual Colorado School Library Survey included a new section to assess the degree to which school libraries use technology to communicate with students and assist them in accessing library resources. A total of 442 endorsed school librarians11 participated in the survey. Their responses show how prevalent various web technologies are in school libraries staffed by an endorsed librarian, as well as which types of schools are more likely to adopt these technologies. 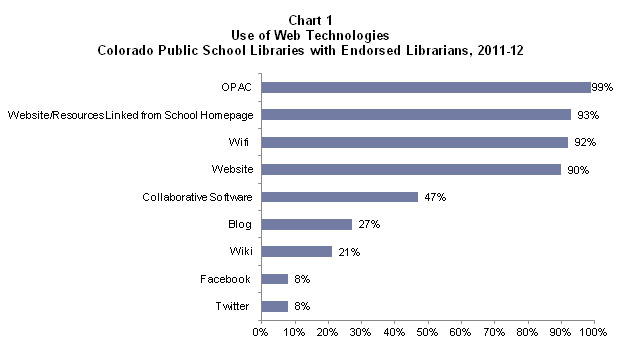 While almost all Colorado public school libraries staffed by CDE-endorsed librarians have OPACs (99%) and 9 in 10 have websites (93%), fewer than 1 in 10 have Facebook and Twitter(8%). With the exception of libraries at combined schools (i.e., schools that combine multiple grade levels, such as K-8, within a single facility), Colorado public school libraries are on the same playing field in their use of basic web technologies. Approximately 9 out of 10 high school, middle school, and elementary school libraries with endorsed librarians have OPACs, websites, links from their schools’ homepages to their libraries’ websites/resources, and wireless internet access for students (Chart 2). 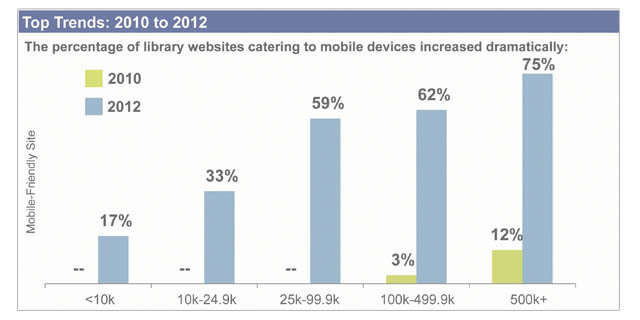 However, middle school libraries outpace all other school library types in their use of Web 2.0 technologies. More than one-half (57%) of middle school libraries use collaborative software, two-fifths use blogs (42%), almost one-fourth (23%) use wikis, and slightly more than 1 in 10 have Facebook pages (14%) and Twitter accounts (12%). Libraries at combined schools are the least likely to have 5 of the 9 web technologies discussed here: OPACs (98%), links from their schools’ homepages (83%), websites (78%), collaborative software (38%), and Facebook (4%). 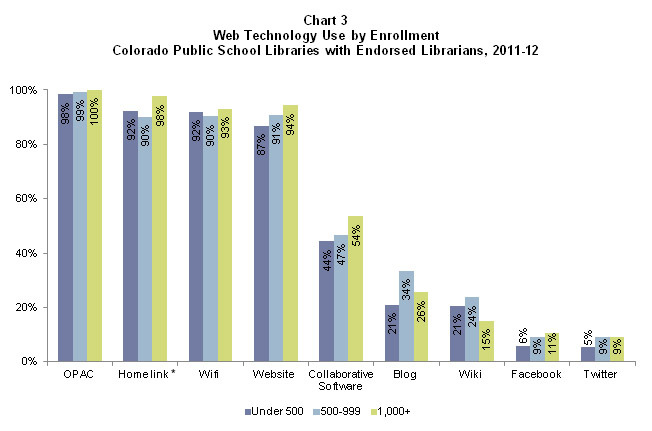 Use of web technologies by Colorado public school libraries with endorsed librarians also varies according to enrollment (Chart 3). Libraries serving schools with enrollments of 1,000 or more (large schools) are most likely to have all of the web technologies except for blogs, wikis, and Twitter. Libraries that serve schools with enrollments between 500 and 999 are most likely to have blogs and wikis, but are either equivalent to or fall behind the large schools in regard to the other technologies. Meanwhile, school libraries serving schools with enrollments of fewer than 500 students (small schools) are least likely to have all of the web technologies except for links from their schools’ homepages, wifi, and wikis. Maintaining an online presence certainly offers advantages to school libraries, especially in situations when personal interaction is not feasible. Becky Russell, School Library Content Specialist at the Colorado State Library, remarks, “By using and providing leadership in technology, school librarians can help their students and staffs become more digitally literate and provide access to library resources 24/7. In addition, school librarians’ use of interactive web technologies can offer collaborative opportunities and feedback that will help them improve their chances of providing outstanding and essential customer service.” Though few can deny the benefits of maintaining an online presence, not all school libraries can afford to commit to this endeavor, especially when funding—and therefore staff—is stretched thin. During the coming years, it will be important to track web technology adoption trends over time, to determine whether more school libraries are able to overcome budgetary and other obstacles to take advantage of virtual tools and the learning and communication opportunities they afford. 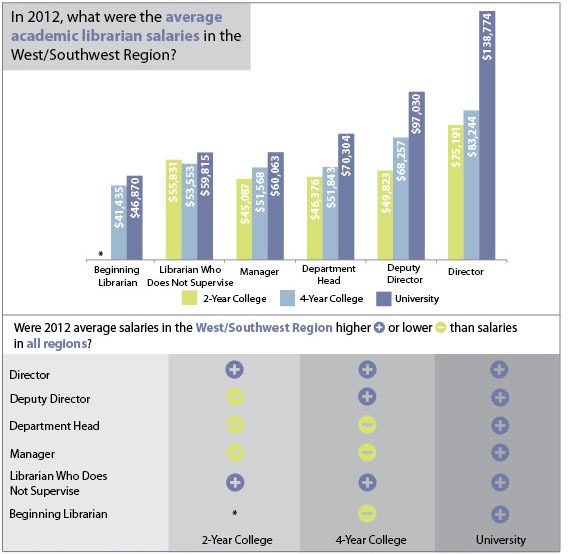 In 2011-2012, 442 school librarians14 participated in the annual Colorado School Library Survey. 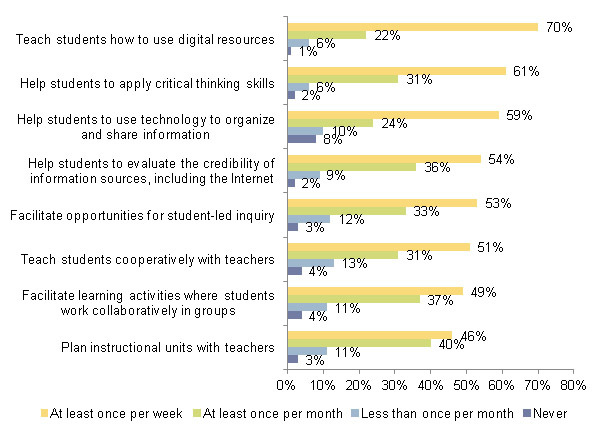 The survey included a new section that focused on 21st-century instruction strategies. Respondents were asked how often they engaged in the eight strategies listed below, which reflect the CDE and AASL standards. 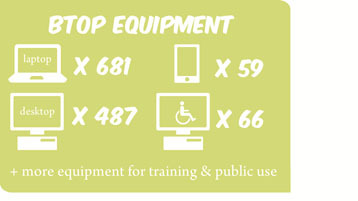 A total of 57 PCCs offered 1,364 classes to 8,625 participants between March and December 2011. Of these PCCs, 26 (46%) administered a survey in their classes to receive feedback from participants. 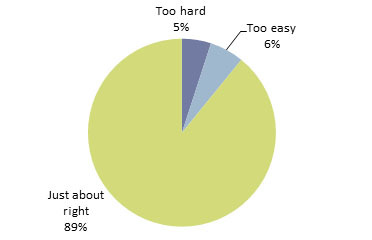 Between May and December 2011, 151,755 participants completed the survey, which contained questions about the class, as well as about participants’ previous experience with computers. 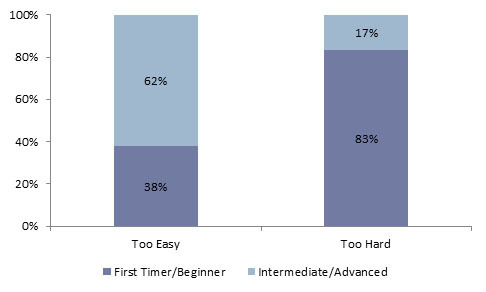 More than 9 in 10 respondents agreed or strongly agreed that the instructor presented the information clearly, that they learned a valuable skill in the class, and that they would be able to use what they learned (see Chart 1).17Overall, respondents expressed satisfaction with the classes, with more than 95% strongly agreeing or agreeing that they would recommend the class to someone else.